The Dynamics partner team has set up a great Convergence resource site for Dynamics partners. It contains a comprehensive set of through-partner marketing templates and assets, plus a downloadable PDF guide with “A to Z” planning tips and tools. The value of Convergence can be a huge for a partner. These are tough times and it may be tempting to cut costs by not attending conferences. Convergence is designed to help you make the most of your time to network with potential partners and customers and build your business. 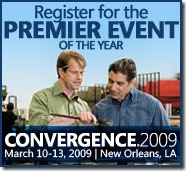 As a proven revenue generator, Convergence 2009 New Orleans should be considered a marketing opportunity rather than an expense. Convergence has the proven power to drive and close business, build client relationships, demonstrate customer appreciation, and build credibility. Partners consistently cite the opportunity to develop relationships with their customers as the most important benefit of attending Convergence. Whether it’s getting to know customers better, spending time with them in a less formal setting away from the pressures of day-to-day business, or the opportunity to organize business meetings with potential vendors and partners, independent software vendors (ISVs), and Microsoft team members, the networking value of Convergence is tremendous. For additional information about Convergence 2009 New Orleans visit the conference home page.